This native, long-lived, perennial will display large, brilliant lavender flowers on stout stems with evergreen basal foliage. 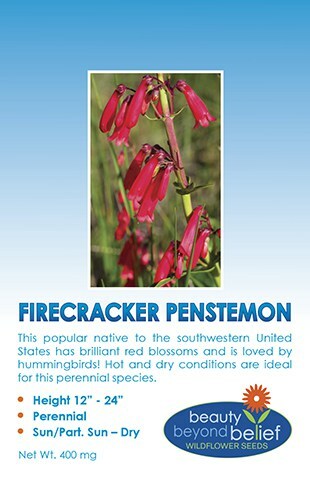 Also called Venus Penstemon. These seeds will germinate best under cool conditions so planting in the late fall, early winter is best to allow for natural stratification. Or, for planting in the spring, stratify the seeds in cold moist conditions for 8 – 12 weeks. Blooms will be seen the second or third season after planting. Plant 1/8-1/4 inch deep in a site with full sun and good drainage. 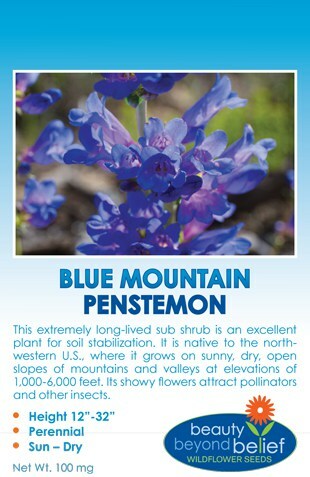 If planting in the spring, Adapted for elevations 1,000-6,000 feet and commonly found in open sunny slopes of western mountain valleys and foothills. The long taproot makes this a great plant for reveg sites or zeric decorative plantings. This species will attract native bees and bumble bees. This extremely long-lived sub shrub is an excellent plant for soil stabilization. Also called Venus or Alpine Penstemon. It is native to the north-western U.S., where it grows on sunny dry, open slopes of mountains and valleys at elevations of 1,000-6,000 feet. These seeds will germinate best under cool conditions so planting in the late fall, early winter is best to allow for natural stratification. Or, for planting in the spring, stratify the seeds in cold moist conditions for 8 – 12 weeks. Blooms will be seen the second or third season after planting. Plant 1/8-1/4 inch deep in a site with full sun and good drainage. 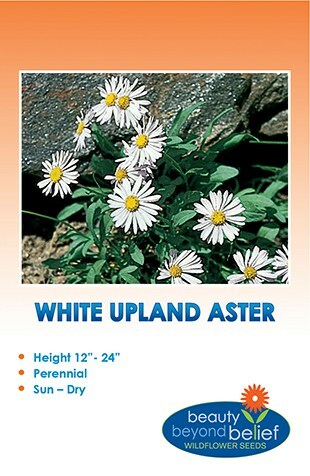 If planting in the spring, Adapted for elevations 1,000-6,000 feet and commonly found in open sunny slopes of western mountain valleys and foothills. The long taproot makes this a great plant for reveg sites or zeric decorative plantings. This species will attract native bees and bumble bees.